A well designed presentation folder is an ongoing, visual reminder of your business, one that potential customers and clients get to keep and refer to as needed. You always want to make sure you address these four areas when creating them. Like all of your marketing materials, you want your presentation folders to appeal to a specific demographic. If your goal is to provide information to investors, make sure that your design has more of a corporate feel; you’ll want them to feel secure and confident in the content they’re receiving. If you’re targeting potential clients and customers then you can be a bit more casual, but you still want to capture their attention quickly while keeping the design in line with your business image. By creating specific folders to accomplish certain tasks and other folders to fit more generic roles, you’re ensuring that your folder is meeting its objective. You want your folder to lead into its content with anticipation from its audience. Imagine you’re opening a gift. You may have a pretty good idea of what’s inside of a present, but you’re still eager to unwrap it and see for yourself. A presentation folder needs to be cohesive with its information. If it isn’t, you risk confusing your audience. If, for example, you were expecting investment information upon opening a folder but received product information instead, you’d be confused and disappointed. You need to make sure that you’re following through on what your folder is supposed to be about. To take it a step further, your folder should lead into the information inside. The best presentation folder designs are simple and effective – not over the top or unnecessarily complicated. You want your folder to be eye catching and convey your message in a direct manner. You’d never start painting a picture before picking out a canvas, so begin by choosing your medium. Let your choice of folder style inform your printed design. We recommend selecting one of the many presentation folders available at CompanyFolders.com; they offer a wide variety of styles to choose from. Use your company’s logo and contact information, but be specific with your placement. There should be definite reasons why they’re in play and a purpose behind those reasons. Use as little text as possible in your design. Of course you’re going to want to use some text, and that’s fine. It’s just that you want to think of your presentation folder as a container. It’s not a brochure. It’s a means of holding other, more in depth materials. Too much detail makes your folder cluttered and ineffective. Instead, try to convey your brand message with color and design. Again, keep things simple. Maximize the printing area of the folder that you’re using. Don’t think that you only have to print on the cover. about printing on the inside. It’s usually an extra charge, but it can be well worth it. Durable materials are extremely important; you want to be able to stand the test of time. Using a high quality stock gives off a polished, professional image. The two main components of the stock itself are its feel and thickness. Because a presentation folder will be touched and handled by it’s audience, you want it to be substantial and sturdy, not just a flimsy piece of paper. The feel of the stock matters just as much. By using lifted inks, embossing, debossing, or even other paper coatings you’re making your folder that much more unique. Being concerned about your stock also helps to reinforce your brand image. You show that you care about the way your marketing materials look and that you’re willing to make an investment in your business. 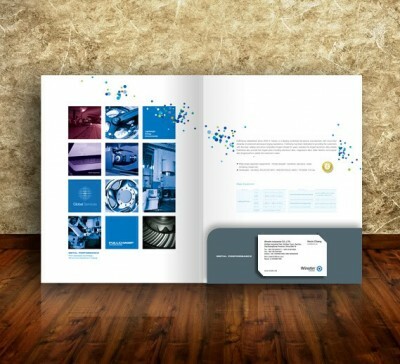 Presentation folders are an excellent way to wrap your arsenal of marketing materials. Keep these basics in mind and they will be a good start at making an effective folder. Remember that a professional looking presentation folder says that you’re willing to take that extra step towards showing your clients how seriously you view your business and, in turn, how seriously you view theirs. Great blog! I believe presentation folder is an important marketing material. It represents your brand effectively and looks quite professional in a meeting.